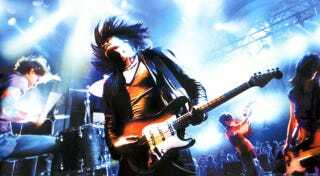 Wii owners, there will be no more Rock Band Network songs for you after January 18. Rock Band developer Harmonix said today that it will no longer be supporting Nintendo's console with new releases. Harmonix's Rock Band Network allowed bands to author their own tracks for use in Rock Band games, without the need to go to the game's creators to make their songs playable in the music game. Harmonix has taken some of RBN's more popular tracks for the Xbox 360 and distributed them on the Wii and PlayStation 3. But that's changing. "With the smaller online install base, limited demand for releases so far and the significant amount of work it takes for our producers and audio team to convert and process these additional tracks we're no longer able to continue submitting RBN content to the Wii," Harmonix writes on the Rock Band forums. Fortunately for Wii owners, regular downloadable songs through the main Rock Band store "will continue uninterrupted."